The Beltway Beast is an outsider's perspective of Washington D.C. and the paralyzing politics that have brought progress to a halt. This book offer new ideas to the problems that are suffocating America. Too often we accept the status quo instead of questioning why things are the way they are. For example, why is the working income taxed at a higher rate than the non-working income? Why do the majority of Americans who are independent have to choose only between Democrats and Republicans for the President of the United States? Why can't we reduce the cost of medical care so that it is affordable instead of relying on health insurance companies as the only solution? Munir Moon is the author of two books. The Middle Class Comeback: Women, Millennials, and Technology Leading the Way, counters the negativity of the dominant narrative surrounding the past, present, and most importantly the future of the American middle class. It presents a hopeful blueprint for its revival with women, millennials, and technology being major factors while addressing the transformation of ever rising healthcare and education costs and taxes that adversely impact the middle class. 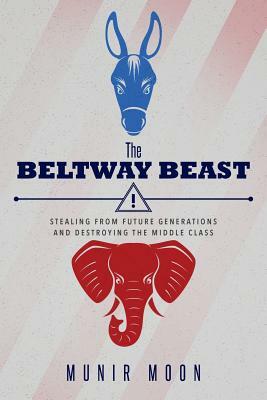 The first book, The Beltway Beast: Stealing from Future Generations and Destroying the Middle Class, transcends the anger and frustration of American people with their leaders failing to solve the country's problems. It documents our current reality and offers transformational ideas, such as shrinking the Presidential Primary process by utilizing technology, reducing healthcare costs through Smart Patient Credits, and using a Value Based Tax system that transfers power from Washington back to the states. Moon spent 8 years in the financial industry, starting at Chase Econometrics and ending in the Savings and Loan Association during the 1980s. He was a first-hand observer of the financial crisis in the 80s, which resulted in the demise of the Savings and Loan industry to be repeated in 2008 in a different form. Moon is the president of Bertech, a Southern California-based small business that has been recognized three times as one of the top 500 fastest-growing small businesses by Inc. 500. Moon blogs at The Huffington Post and is a contributor to LAprogressive.com. He earned his B.S. in engineering, M.S. in economics and M.B.A. in finance from UCLA. He is married with three sons and lives in Los Angeles County, California.